We hope to keep you updated with the latest news and events here. Great fun was had at the Parents' Group Chocolate Bingo Fundraiser at BIPS. Thanks to Stevie and Nicola , our excellent bingo callers and our parents, grandparents, aunts, uncles, friends and pupils who got into the spirit, including dancing to the Macerana! Quite a few lovely chocolate prizes were won and tickets to Jump Box and Nnja Box too! We were very happy to field 3 impressive teams at the last EVO tournament on Thursday 28th March. Our C team was mostly made up of our very talented P5 boys and also Callum from P6. Our B team had the experience of P6 and P7 players and the A team had our talented mix of boys and girls. All 3 teams made their Group Finals and all drew on the day. After 5 League Tournaments our A teams just missed out to a very strong St. Mary’s team for the overall League Title. Mrs Whan would like to thank all the parents who have supported her all year and to the children who represented their school with skill, pride and good manners. On Tuesday 26thMarch 7 boys and 7 girls travelled to Newry for the Regional Heats of FUTSAL. Both teams were amazing in their leagues winning all their matches. The girls drew their semi-final and won with an exciting penalty shoot-out! They continued by winning the Final and are now heading off to The National Finals in Antrim on Wednesday 10thApril 2019! The boys won their semi-final and drew their Final but, sadly were beaten on penalties! During Integrated Education Month, P2s have been using the story of The Ugly Duckling to explore the characters' perspectives through 'hot seating.' Lots of excellent discussion was generated! P3s, P4s and P5s exploring different perspectives during Integrated Education Month, from language and food to good guys versus not so good, to illusions. Some pupils added their perspectives to our Graffiti Board too. Well done to the boys and girls from P.5-P.7 who represented our school in the 'Good conversation' round at the Portadown Speech and Drama Festival on Thursday 28th February. The boys had a discussion about school holidays and the girls discussed reasons for and against zoos. We are proud of you all. Well done! These pupils attend Sinead Lunny Speech and drama afterschool club on Monday afternoons. On Thursday, 22/02/19 Mrs Davis led a celebration of International Mother Language Day in her classroom. Staff, pupils, parents and BIP's Parent Group helpers celebrated other languages, traditions and famous people and enjoyed an Ulster Fry! On Saturday 2nd March Mr Scowcroft and two members of the Film Club, Ronan and Frankie were invited to the BBC Radio Ulster Studios in Belfast to take part in the John Toal Show. They talked about Frankie’s double nomination, the making of the movie “The Time Trike” and the excitement of attending the awards in Leicester Square on Monday 4th March. Our Film Club has been nominated for not one, not two but three awards this year! One of our P.7 members, Frankie, has been nominated for INTO Film film club member of the year and reviewer of the year within his age category. Amazing! The third nomination is for our short film 'The Time Trike'. Please support our Film Club @BridgeIPS from Banbridge in the UK IntoFilm Awards by clicking the link below. Well done to the four P.7 pupils who represented our school in the Credit Union Quiz on Friday 1st February. Congratulations to the four P.7 pupils who represented our school in the recent Road Safety Competition. On Wednesday 23rd January many parents from both our school and our Shared Education partner school, St. Ronan's, attended an inspiring talk by psychologist Shane Martin. It was a fantastic evening and we were delighted with the great turn out of parents from both schools. A huge thank-you to Shane for this wonderful session and to our parents' group who made provided refreshments. On Friday 25th January the Dairy Council came in to work with P.5 & P.6 to teach us how to get the balance right to stay healthy and active. Pupils were taught all about the different food groups and enjoyed joining in with a rap about eating healthily and taking exercise. Children enjoyed putting their fitness into practice by dancing and exercising to music. The dairy council gave each pupil an informative booklet about the main food groups and having a balanced diet to take home and share with their family. Primary 5 children were given a talk about the importance of fire safety awareness by Lee Murray. They heard about checking smoke alarms, the dangers of using candles in the home and what to do in the event of a fire. The pupils were given a pack filled with fun activities highlighting safety issues. They thoroughly enjoyed the presentation and couldn’t wait to use their packs! Our Primary 7 choir pupils had the opportunity to visit residents in Spelga Mews and join with them for some carol singing. The residents happily sang along and P7s thoroughly enjoyed taking time to talk with them at the end. Happy Christmas to all our friends at Spelga Mews. On Tuesday 18th December we enjoyed a delicious Christmas dinner in school. Pupils and staff wore colourful Christmas jumpers and the school was buzzing with festive spirits. A huge thank-you to the kitchen staff, supervisors and extra parent helpers for all of your help. P.3 pupils reminded us all about the real Christmas story and we were amazed by the wonderful singing, acting and musical accompaniment. The P.3 pupils, their teachers and assistants have clearly worked very hard over the last few weeks and they should all feel very proud of their efforts. Well done P.3 we all thought you were fantastic! Congratulations to all of very special pupils in P.1 and P.2 who put on a super Christmas play. It is always very charming to watch our youngest pupils perform on stage. I'm sure teachers and parents would agree that they all looked absolutely adorable in their colourful costumes. Well done P.1 & 2 pupils, their teachers and assistants, for all of your hard work over the last few weeks. Boys and girls - you should all feel very proud of yourselves. A huge thank-you to all our parents, pupils and extended families for supporting Santa's Grotto on Friday 7th December. I'm sure everyone will agree that it was a very enjoyable evening for the whole family and it certainly helped us all get in festive spirits in the run up to Christmas! On Monday 26th November 2018, 40 members of our school choir went to the BBC studios in Belfast to record a Christmas Carol. What an experience these lucky children had! They were recorded in the BBC studio and got to meet some news reporters and of course see all of the important things that happen behind the scenes. It is safe to say that pupils were well impressed by the huge green screen, the lighting and cameras. The pupils' behaviour was excellent and they thoroughly enjoyed the whole experience. We would like to say thank you to the staff at the BBC who made our staff and pupils feel very welcome. We will let you know as soon as we know when it will be aired in the run up to Christmas. On Monday 26th November we welcomed Billy from The Policing Community Safety Partnership to key stage assemblies. He gave an informative talk about how to seen and be safe in the darker mornings and evenings, on our way to and from school. Remember Wednesday 28th November is Ditch the Dark Day so come to school in bright reflective clothing. Click on the following link to see the fun and adventures that P.6T had on their residential trip to Shannagh-More Outdoor Pursuits Centre this week. Click on the following link to see the fun and adventures that P.6S had on their residential trip to Shannagh-More Outdoor Pursuits Centre this week. Congratulations to five pupils below who represented our school in the recent Swim Ulster Schools Cup & Championships in the Aurora Aquatic and Leisure Complex on the 20th and 21st October 2018. Lots of determination & skill was displayed and some even achieved PBs. Best of luck to those who qualified for the Irish Schools Championships in February 2019. We are overwhelmed by the fantastic response to our food drive in the run up to our Harvest Service. A huge thank-you to everyone who donated food. We really appreciate everyone's support and hope that this food will help less fortunate families within our local area. St. Vincent DePaul and Banbridge Storehouse will distribute the food to those in need. On Monday 15th October we celebrated our annual Harvest service in school. The theme of our celebration this tear was rainbows. P.5 led this celebration with a variety of readings, prayers and poems and they were amazing! Rev. Gray from Bannside Presbyterian joined our service. As always Rev. Gray shared his own special message with us. Many thanks to all of the parents who joined us. It was a very packed hall and the lovely singing throughout really made it feel special. There are a few more photos on the P.5 page. Well done too the boys and girls who participated in EVO's second tournament on Thursday 11th October. Super teamwork and sportsmanship was displayed throughout. Congratulations to our A team who were joint winners with St. Mary's Primary. I think it's safe to say both A teams from Bridge and St. Mary's are delighted! P3s planting flax seeds as part of the local history link in our Linen Lab Art Project. Seeds....flax flowers....linen. Artist, Rachel, worked with P7 pupils on pin wheel craft. We are going to make a pin wheel structure to display at F E McWilliam Gallery. Writer, Heather, worked with pupils on short drama pieces about real residents from Reilly Street in the 1900s. A local artist Rachel and a writer Heather, introduced the ABC/FE McWilliam Linen Lab Project today, with art activities linked to the local history of linen production in our school area. Heather shared the story of her aunt Kathleen via an embroidered linen dress and the pupils enjoyed flower drawing games, at speed, eyes closed, non-dominant hand, led by Rachel. Our next School Council event is a Sponsored Silence in P1-4 on Monday 1stApril 2019. Sponsorship forms will be sent home with pupils on Thursday 21stMarch. Please note P.5-7 will participate in the silences but because they have a different sponsored event linked to Shared Education later in the the month they did not need to collect sponsorship for this event. Our playground equipment is very low at the minute and needs urgently restocked. Please ask family and friends to support this worthwhile cause. Pupils in P1-4 will take part in 3 x 10minutes sessions during the day. There will be an Easter surprise for the biggest fundraiser in each class. On Friday 22nd March P.5 pupils presented an assembly to tell us all about the upcoming Big Pedal initiative. Schools will be entered into a daily prize draw for rewards including equipment and accessories if over 15% of our school community cycle, walk or scoot on that day of the challenge. WOW! Our very own Frankie has just gone a won an amazing award at the recent Into Film Ceremony on Monday 1st March 2019. Frankie was announced a Film Reviewer of the year for his age category. We are all so very proud of him! This is an amazing achievement and very well deserved. Activity Based Learning Workshop facilitated by Joan Henderson and attended by schools in the area including our Shared Education partners St. Ronan’s. On Friday 1st March we bid a fond farewell to our school crossing control lady - Karen Adamson in assembly. She had been with our school for many years and was sad but ready to move onto a new job. Eimear-Rois presented her with some flowers and a gift which many parents kindly contributed to. We wish her the best of luck. Peace Proms 2019 at the SSE Arena was definitely well worth the wait! What a fantastic experience enjoyed by our choir members, staff, parents and family members in the audience. We were thoroughly entertained by some amazing singers & dancers and were blown away by the talented musicians in the cross border orchestra and of course the wonderful sound of 4,000 pupil voices. We sang and danced along to a variety of popular tunes from Ed Sheeran, Coldplay, Prince’s Purple Rain… to name just a few. Greg Beardsell was outstanding conducting not only the orchestra but all the actions of the kids. We had such an amazing time - special memories to be treasured. Here’s looking forward to doing it all again next year! Four P.7 pupils led an assembly for P.4-P.7 and four P.6 pupils led another one in P1-P.3 on Friday 1st February. These pupils did an excellent job promoting Internet safety and advising pupils how they can keep themselves safe online by making smart choices and by asking permission before passing on photos or comments. On Thursday 24th January, a film crew from Into Film in London came to visit our Film Club. The premise of the video was to film our Film Club in action but also to film Frankie in P7, who has been nominated for film club member of the year at the Into Film Awards. The crew interviewed Mr Scowcroft, Frankie and four other members of our club to help them find out more about Frankie and also to produce a clip that will be shown when it’s time for Frankie’s category. This visit had been arranged from before Christmas and in the time since we have found out that our film club has been nominated for their movie, The Time Trike. Alongside this Frankie has been nominated for another award: - Film Reviewer of the year. This is a very prestigious award and is open to children aged 5-18. So, on the 4th of March Frankie, Mr Scowcroft, Mrs Devlin and a few members of the film club who made The Time Trike will be going to the awards in Leicester Square, in the heart of the West End. Congratulations to Aine who is Bridge I.P.S's first word millionaire this academic year! The class that has read the most words so far... this year is... P.7R. Well done boys and girls who together have read a massive 7,315,596 words (27th January). Everyone in P.4-P.7 keep reading to help your class up the leader board! Well done to year 8 past pupils from our school, Logan, Jude, Carly and Katie who came in to talk to P.6 & 7 pupils about their experience of their own first term in Newbridge Integrated College. Newbridge open day is this Saturday 12th January from 9.30-12.30. All 0.6 & 7 pupils are encouraged to attend to see the college for themselves and to get a feel for what it is like. On Monday 17th December we celebrated our annual Christmas Carol service in the beautiful surroundings of Holy Trinity Church. This was a whole school celebration led by the choir and our P.6 pupils. Pupils reminded us all of the true meaning of Christmas through songs, prayers, drama and poetry. Well done to all of the pupils and staff involved - you were fantastic! A huge thank-you to Arch Deacon West for giving us a warm welcome and joining in our celebration and to Dr Barr our charity guest speaker from Charlene's Project. As always, we would would like to thank parents, carers, grannies, grandas and extended family for supporting our pupils and sharing their special event with us. Congratulations to Max P.6T who was a winner in the recent C2K Newsdesk Competition. Pupils from all over Northern Ireland were encouraged to write a news report about what makes them happy. As you can imagine there were so many things that make children happy. A few things were very popular like family, friends, pets, holidays, different types if hobbies and sports and lots more. It was lovely to see photos from a number of our P.6 pupils included in the Newsdesk article. Log on at home or school to have a read and remember to like and comment too! 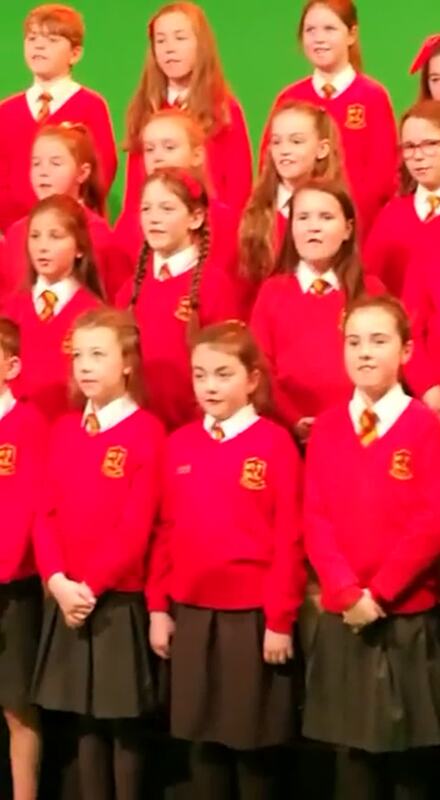 Our school choir was honoured to be asked to join Banbridge Musical Society and sing at their recent show Songs from the Greatest Shows on Saturday 24th November. They sang A spoonful of Sugar from Mary Poppins and were joined by Stephen Cairns to sing From Now On from The Greatest Showman. As always, the pupils were amazing. Thank you Stephen Cairns for singing with our pupils and making the whole experience lots of fun and to everyone involved in Banbridge Musical Society. It was a fantastic night - special memories for our children and their parents to cherish. On Wednesday 21st November Bridge was a sea of green as pupils and staff arrived in school dressed in something green to support the NSPCC. Judith and Sylvia from the NSPCC came in to teach pupils that they should always be able to talk to a trusted adult. They demonstrated how children shouldn't need to carry around a bag of worries and that they could always turn to a trusted adult or Childline if they really need help. Pupils were told about the diefferent types of abuse and the importance if keeping their private parts private. This important message was given to pupils throughout the school in assembly and was followed up with workshops for P.6 & 7. Everyone is busy this week exploring this year's theme of Respect. Our anti-bullying ambassadors are out in force observing in the playground to identify those children who are displaying kind behaviour to others. Smiling is contagious throughout the school and pupils and staff are working hard to compliment each other - this makes everyone feel good. On that note let us compliment the anti-bullying ambassadors for all of their hard work and great ideas to help us celebrate this year. Whilst P.6 are in Shannagh-More for most of the week, they are also putting respect into active practice in an outdoor setting. Let's hope the leaders and Centre staff compliment our pupils on their respectful behaviour, manners and lovely smiles too. Click on the link to see some of the events throughout the week. In a special assembly we remembered all the soldiers who died during World War One and beyond. On Saturday 10th November, Banbridge Polish school celebrated 100 years of Polish Independence through action, dance and music at Bridge IPS in the company of the Polish Ambassador in Ireland. Everyone had a wonderful afternoon. Well done to the four P.7 pupils who were involved in the recent National Young Mathematician Awards challenge in Belfast. You have represented our school well and have done yourselves proud. They have got through to the regional finals for Northern Ireland on 5th December. If they are lucky enough to win they may have the opportunity to go to Cambridge University to take part in the national finals in January. Congratulations to all pupils who have been reading and have completed quizzes in Accelerated Reading, many gaining 100% accuracy in some quizzes. Congratulations to the winners of our draw for September and October. They both won a £10 voucher for Amazon. Keep reading everyone! First reactions from P.6T were; "Wow we can see the green and the lights are on...I want one of those at home for gaming." We welcome any donations from parents to help roll out these fantastic new boards in more classrooms. Pupils in the Lifeskills group have been busy making apple crumble with Mrs Proctor. Pupils had to read and follow the recipe as well lots of measuring, chopping and rubbing! Though I am sure all the pupils would agree... the best part was eating the finished product!